Our kids are just now getting to an age where traditions are actually meaningful and fun. Growing up, we didn’t have a lot of Easter traditions. We went to church and had a family dinner (we had family dinner every Sunday, though). We did get Easter baskets as well, but I remember the baskets more than anything I actually got in them. Mine was pink, made out of cloth and had a fun little stuffed rabbit head on it. Mr. Napping’s Easter bunny would actually hide their baskets and they had to go find them before they could open them. So, we’ve adopted that tradition in our little family. Last year, Monkey (2) didn’t understand the hunt, he wasn’t really sure what he was looking for… but this year I think he’ll be super excited to hunt his basket. Syrup is optional… as are the little helpers just outside the photo. Just kidding about the syrup. It’s leftover from our breakfast adventures. – Blow up as many water balloons as you want. Make them as big as you want. Check out the shape and size and reshape them by gently squeezing the balloon a little until it’s egg shaped. 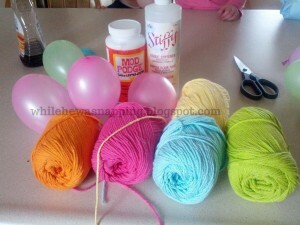 – Coat the balloon with a thin layer of glue or mod podge. 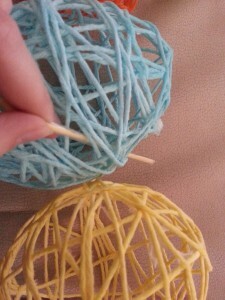 – Lay the end of one skein of yarn on the balloon and wrap the yarn around the balloon until it’s nicely covered. Wrap the yarn so the balloon is covered randomly or in a pattern. 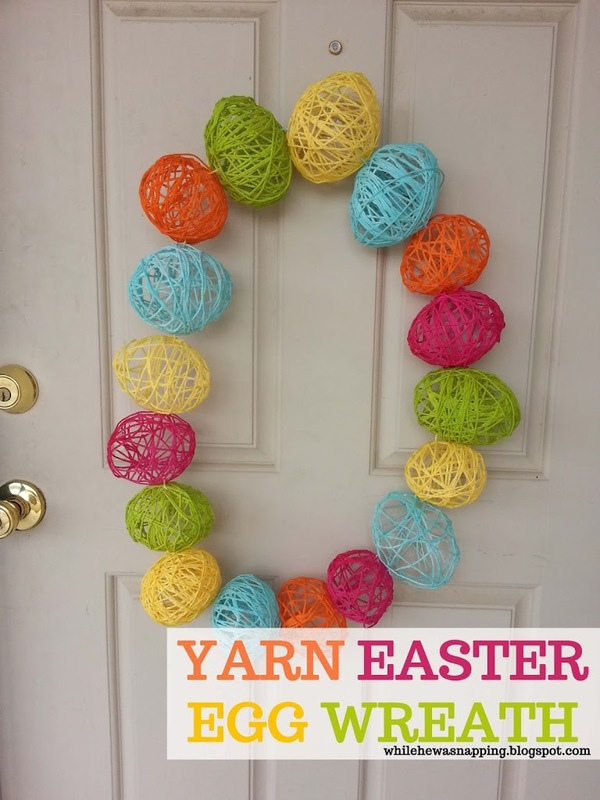 The more yarn you use the sturdier your finished egg will be. – When the balloon is covered to your satisfaction with the yarn, apply a generous coating of glue or mod podge. – Set the balloon on a jar or other base and let it dry. – Repeat the above steps for all the balloons. Let them dry completely, approximately 24-48 hours. – When the glue is nice and dry, pop the balloons and remove all pieces. – Take a long strand of yarn (approximately 18-24 inches or more) and wrap a piece of packing or duct tape around one end, creating a make-shift “needle”. This will make it easier to tie your eggs together. – Begin with two eggs and thread the “needle” through the side of one egg and back out. 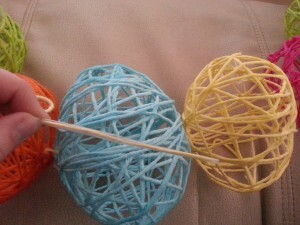 Repeat with a second egg and then tie the two ends of the string together in a knot. – Trim the strings so the yarn doesn’t show as much. – Repeat until all your eggs are connected in a circular shape. * Use enough glue to thoroughly cover the yarn. The more glue the sturdier the finished egg. Be aware that the more glue you use, the more your balloons will stick and you may have to pull out more pieces of balloons when you pop them. * Try to evenly space the yarn while you wrap the balloons, it will help you tie them together at the end. * Let the glue dry COMPLETELY or your eggs will smash. * Make your “needle” as long as you need. 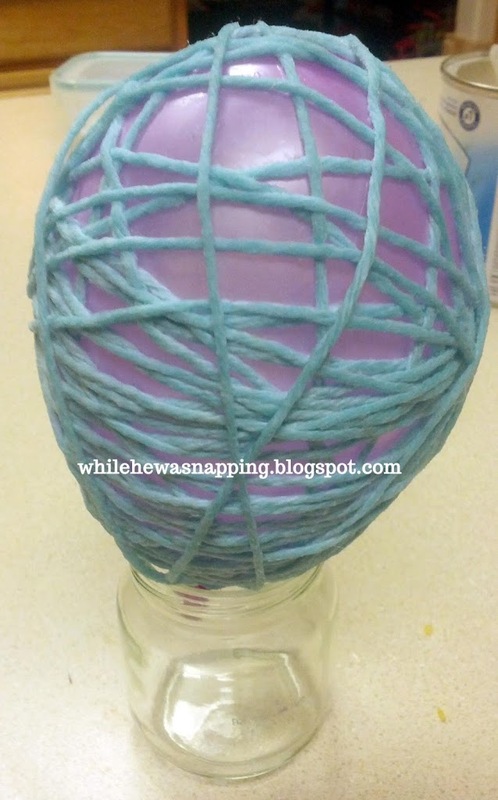 If it goes all the way through the egg it will be easier to thread the yarn through the eggs. * If your wreath is droopy, use a wire coat hanger and shape it. Then thread the wire through the eggs and secure the end together. 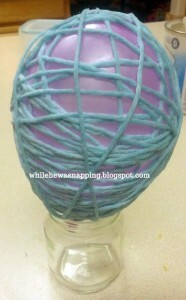 A bit of spray paint will help hide any unsightly wire, but paint it before you thread it through the eggs. Or attach the eggs to a wreath form. 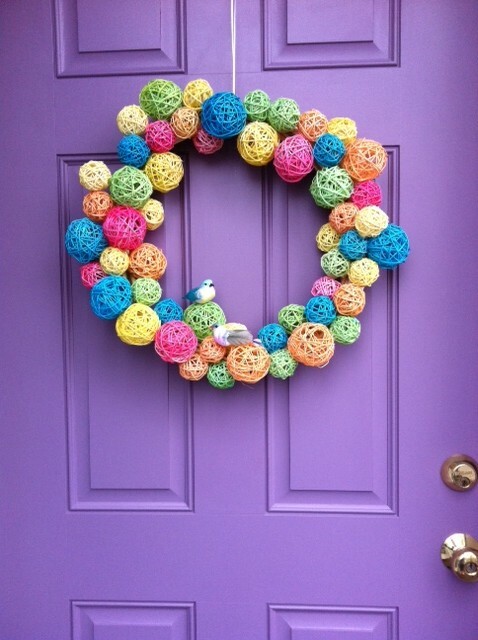 * Not a wreath kinda girl? That’s okay! The eggs make fun vase fillers and garlands too! Blow your balloons up smaller for smaller eggs. 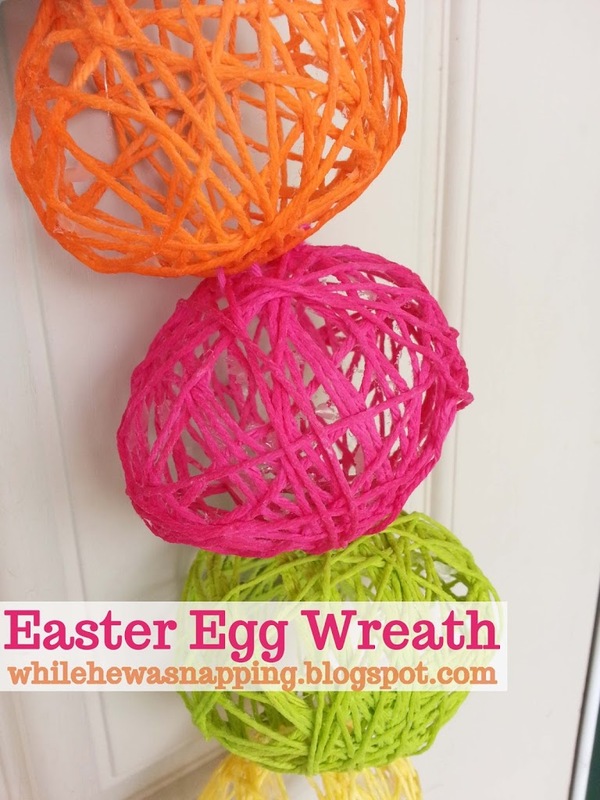 using rattan balls and other things she found at her Dollar Tree. so that’s why I went with yarn balls. Very innovative of you! Still from Someday Crafts links.